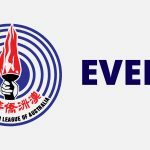 Notice is hereby given that the 79 th Annual General Meeting of Chinese Youth League of Australia Inc will be held on 22 April 2018 (Sunday) at 11:00am – 1:00pm at 10 Dixon Street, Haymarket 2000. CYL paid-members are allowed to vote in elections. For those members who haven’t renewed their annual subscription, please renew before the AGM. Thank you! For those members who would like a copy of the Nomination Form and/or Proxy Form, please download on our website www.cyl.org.au or pick up a hard copy from CYL office. The AGM to start promptly at 11:00am, please plan to arrive 15 minutes early to allow for seating.